The popularity has grown in regards to companies allowing pets in the workplace. This is a rising trend we’ve been seeing in the offices we renovate—and has been an open policy in our offices too. According to CNBC report, 8% of U.S. workplaces now have a “bring your pet to work” policy—that’s up 3% from just 2013. 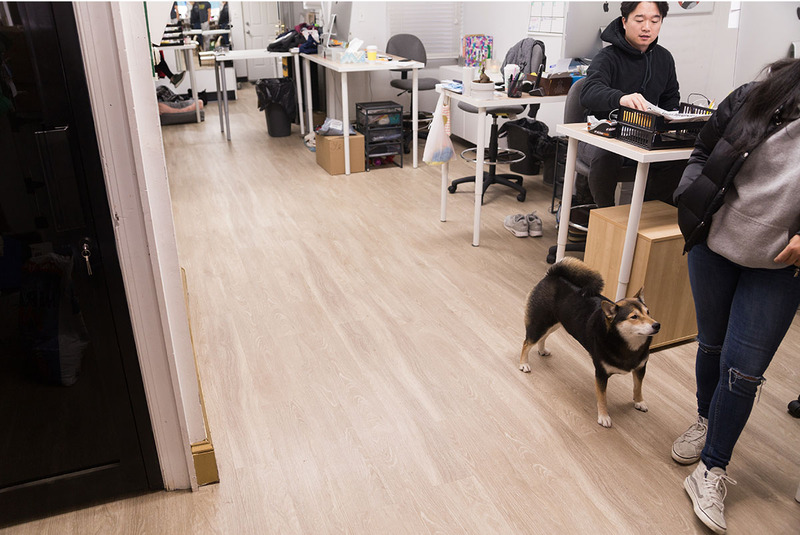 While taking your dog or cat (yes, cat) with you to the office was almost unheard of only a decade ago, today it’s not uncommon to see furry friends wandering office hallways or lying under desks. There are good reasons for that. Less Stress – Research has found having pets around reduces stress. That translates to the office too—for both pet owners and their co-workers. Greater Productivity – Without having to worry about getting home to feed or let out a pet, many employees will work longer hours. Taking “play breaks” also helps keep employees energized. Closer Relationships – People bond over pets. As employees get to know each other’s pets, they also get to know each other better. Of course, along with the benefits of having pets in the workplace also come some challenges. One of those challenges is the impact cats, dogs, and other pets can have on the safety and durability of your commercial flooring. As many pet owners know, paws, claws and unexpected accidents can wreak havoc on carpeting—diminishing its appearance and creating the need for early restoration and replacement. Fortunately, there are ways to allow pets in the workplace and preserve your carpet too. It just requires a little extra thought and planning. 1. Spot clean accidents right away. Act fast to prevent stains and permanent damage to your carpet. Use a spot cleaner with peroxide to clean and sanitize the carpet. 2. Get the right kind of carpet. If you will have pets at the office, it helps to have the right kind of carpet. You should plan for fluids. You want a carpet with a moisture barrier backing under the nylon. That allows you to better clean and sanitize the carpet. If you don’t have that, the moisture will get into the backing and/or cushion and unpleasant odors will follow. Hire professional cleaning twice a year. You should consider hiring a professional maintenance team to steam clean the space. Extracting waste and dander that is caught deep in carpets and seams. Less Hair – We are able to get out a LOT of dog hair that vacuums don’t pick up from your carpet. Pet Safe – Our chemistry isn’t dangerous to pets so you can deep clean your carpets without worry. Sanitization – Our chemicals sanitize your carpet, which is crucial in an office where pets may occasionally have accidents. Deodorization – Our system also neutralizes odor at the source to keep your offices from being overwhelmed by the scent of pet. Snag Repairs – With each cleaning, our technicians will look for and trim any carpet snags from frisky cats or dogs to prevent unraveling. The ultimate in durability, this nonporous surface has a big upside, it won’t scratch or stain, it can be made to look like stone or wood, and since it’s moisture-proof, cleanup is easy. Other ceramics work well too; just skip porous stone tile, which needs periodic sealing. Concrete has similar advantages. Epoxy grout (tile) or an epoxy finish (concrete) minimizes upkeep. Dogs will enjoy their coolness in summer; radiant heat can warm them up in winter. One downside: These floors are hard. Prefinished wood floors with a factory-applied aluminum oxide top coat resist scratches and dings best. A matte penetrating-oil finish can disguise scuffs and is less slippery—just touch up nicks with a stain pen or putty. Stick to harder species such as oak, hickory, or Brazilian cherry. Its major plus: Wood can be repaired. Says Cantin, “If something goes very wrong, you can cut out and replace a whole section.” Bamboo, a grass, can perform—and look—much like hardwood today. Glued down as sheets, planks, or tiles, both are durable, clean up easily, and are low maintenance—though linoleum should get a yearly polishing by a pro. But frequent pet accidents can be an issue with glued-down flooring. The ammonia in urine and acids in vomit can seep into seams and degrade glues over time, so sheet materials stand up best. Those chemical compounds can also degrade the fiberboard core of floating click-together versions. 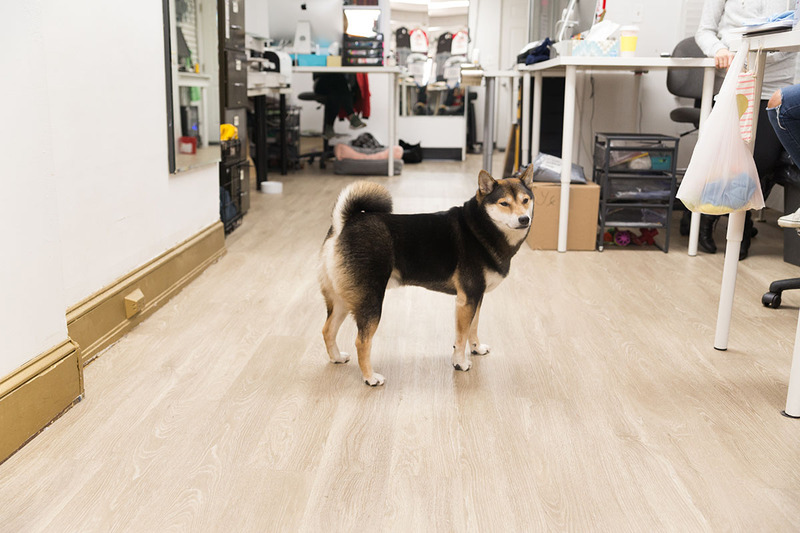 In need of an office makeover that’s safe and pet-friendly? Talk to our experts right now!